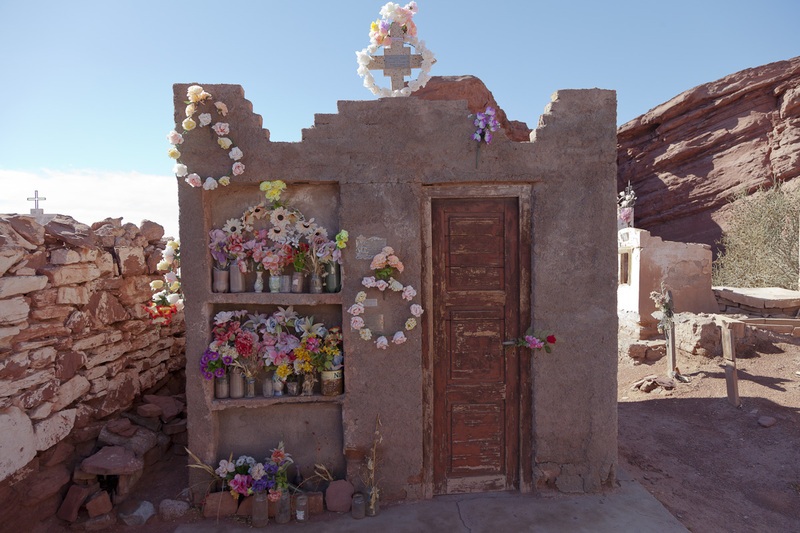 It is hard to travel anywhere in Argentina without encountering evidence of a culture with an “eternal fascination with the deceased” that extends far beyond the walls of the famed Recoleta cemetery into the most remote rural village. 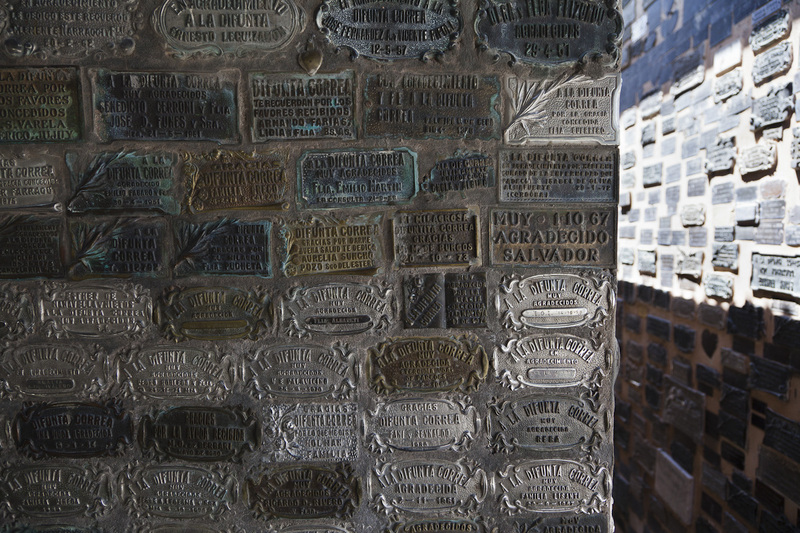 (Ortiz, 2011) The cadavers and places of death of those who earned fame, held positions of power, or died under tragic and mysterious circumstances take on a sacred presence commemorated with rituals, processions, offerings and altars at roadside stands and cemeteries across the country. 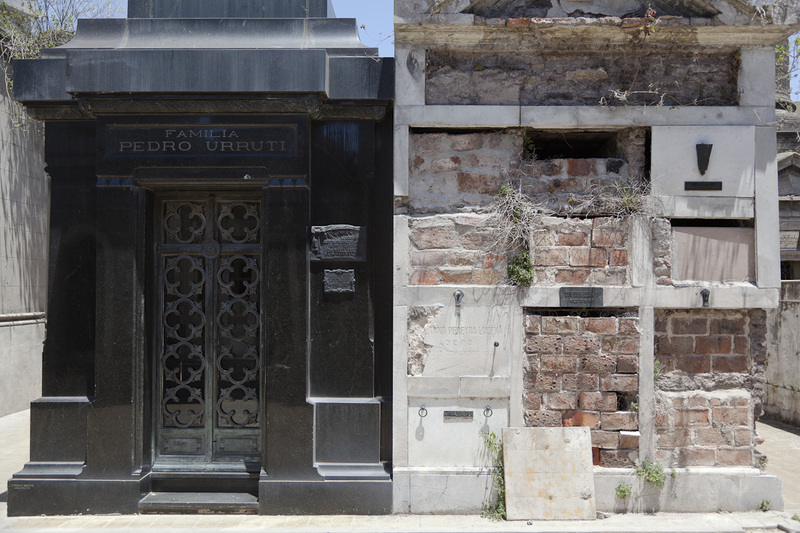 The Recoleta cemetery, with tree-lined avenues of mausoleums representing the past and current elite of Argentine high society, is visited by thousands of tourists each day. Evita Peron, whose fame superseded her low class, was finally buried here 16 years after her corpse was “disappeared” by the military junta in order to discourage public adoration at her tomb. The importance of human remains “arises from the belief in the influence of the dead on the world of the living”, a belief that was exploited by the military during their seven-year repressive rule in which they “disappeared” 10 – 30,000 Argentines. The generals extended state terror into the hereafter and eliminated the possibility of mourning and political protest strengthened by the bodies (and evidence) of their victims. (Robben, 2004) The consequence is that to this day there are thousands of families who do not know the final destination of their loved ones. 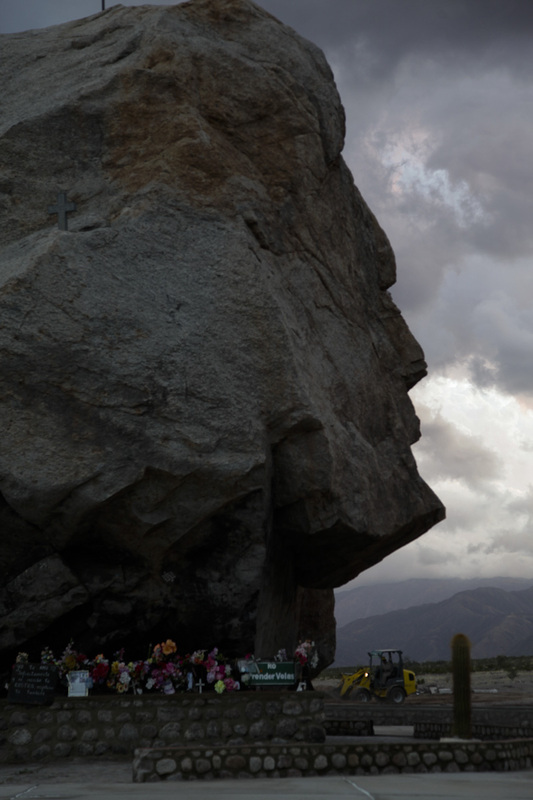 Sites of death and tombs are places of miraculous power in Argentina, as are natural phenomenon with figurative appearance. 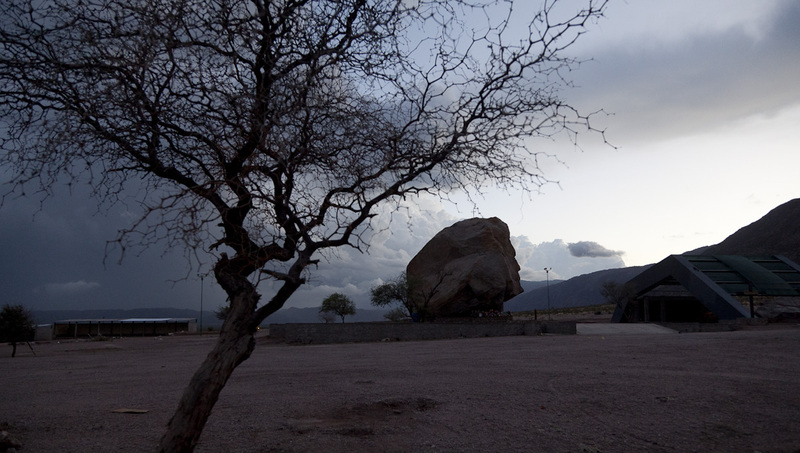 Señor de la Peña is a very large boulder that appears to have a human profile naturally appearing on the right edge. It’s base, once charred black by the constant burning of candles and completely surrounded by amulets and other offerings, is now a provincial park surrounded by a large parking lot. Despite the park prohibition, offerings are left each day. Villa Union in La Rioja contains the site of an angelito at the town’s cemetery. The child died just under year old in 1986, but his coffin was discovered mysteriously unearthed each morning for six days. On the seventh day the ataud was opened and it appeared that the baby had become mummified. A special mausoleum was built and the coffin, now with a built in window, is placed in the center. The room, which is open to visitors, is completely covered on the inside by offerings of gratitude for the angelito’s intercessions for healing and acquisition of trophies, homes, and cars. The angelito is a young and growing legend and has yet to gain the national following of La Difunta Correa. 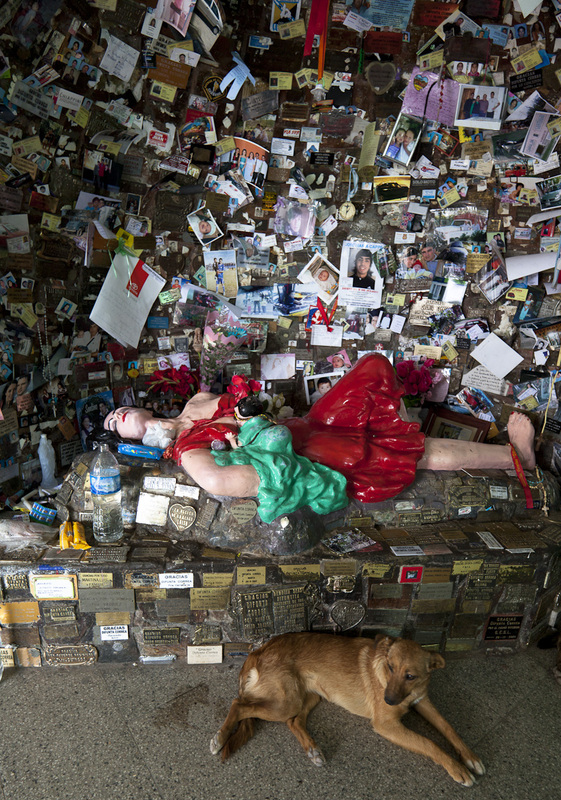 La Difunta Correa (see previous explanation) is honored at thousands of roadside stands, but primarily at the site of her death in San Juan where people leave tokens of their gratitude, including models of homes, plaques, wedding dresses, license plates, trophies, diplomas, military uniforms….the list is really never ending. 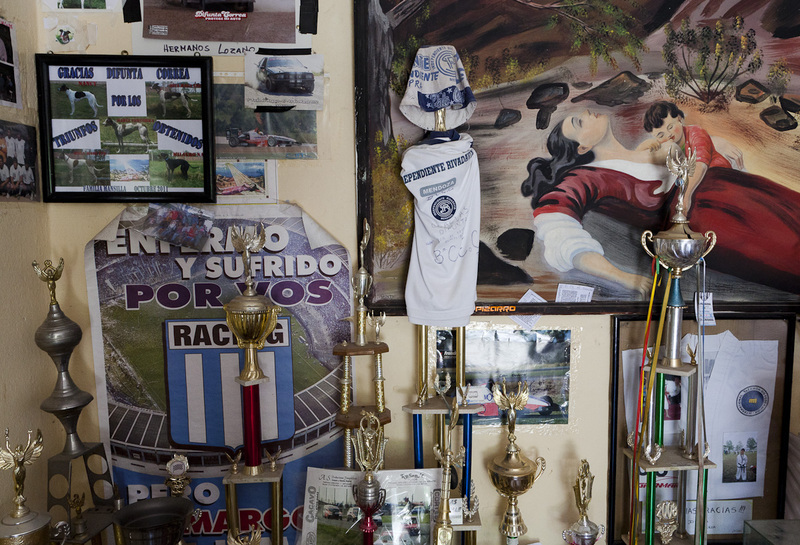 Among the objects are many photographs, snapshots that represent an item that La Difunta Correa has provided from someone. 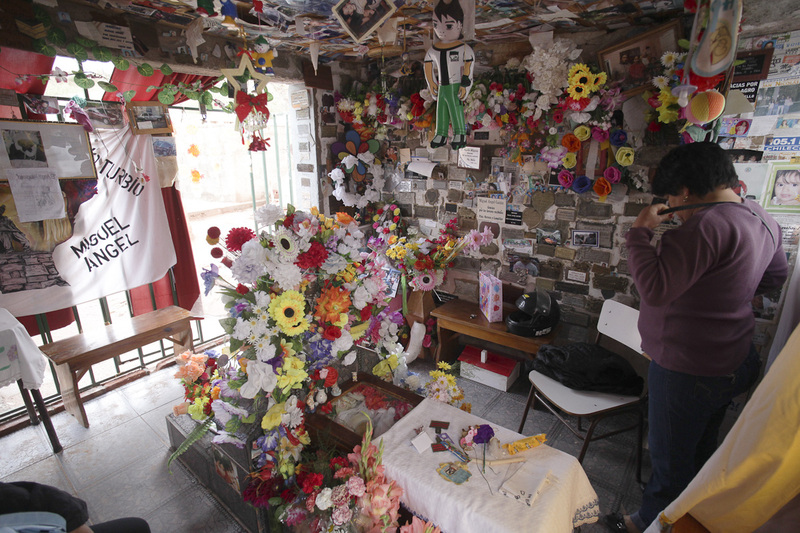 The photographs register the completion of a promised visit to honor her place of death. There are many photographs of children left for La Difunta’s blessing. The combination of mass production and a consumer society with mass adoration is overwhelming. The passionate obsession of followers occupies every visible surface. 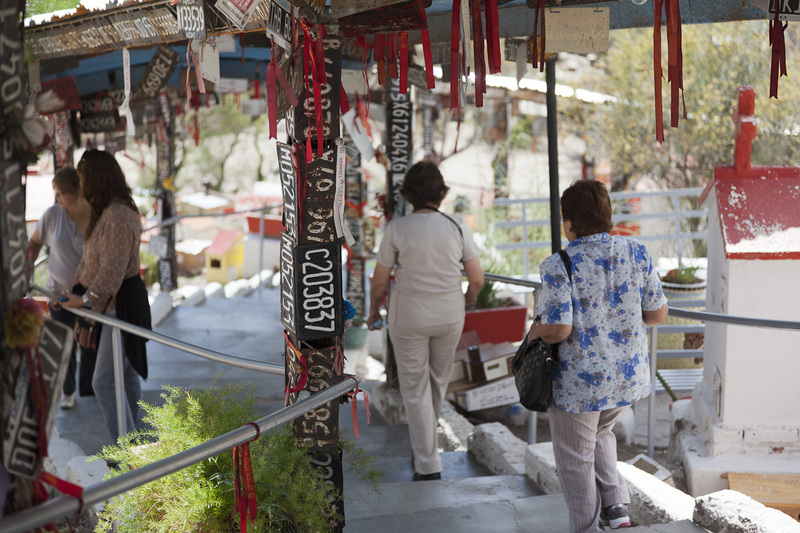 The multiple sidewalks to the top of the hill to her temple are lined with thousands of offerings and the roof and pillars of the walkways are completely covered with flowers, license plates and plaques. The wax that drips down from the smoke-blackened rock at the top of the hill is channeled into a special pool at the bottom. 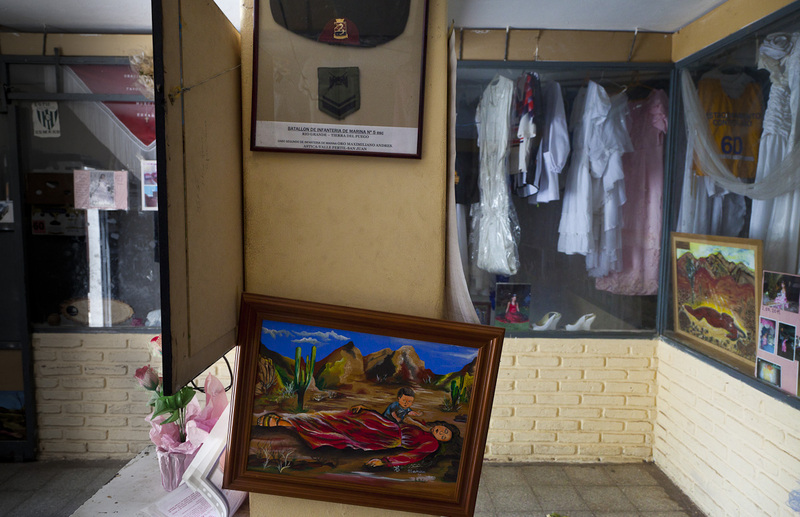 The surrounding area has thematic rooms for the offerings, including rooms dedicated to brides, athletes, truck drivers, construction workers, the military, among others. 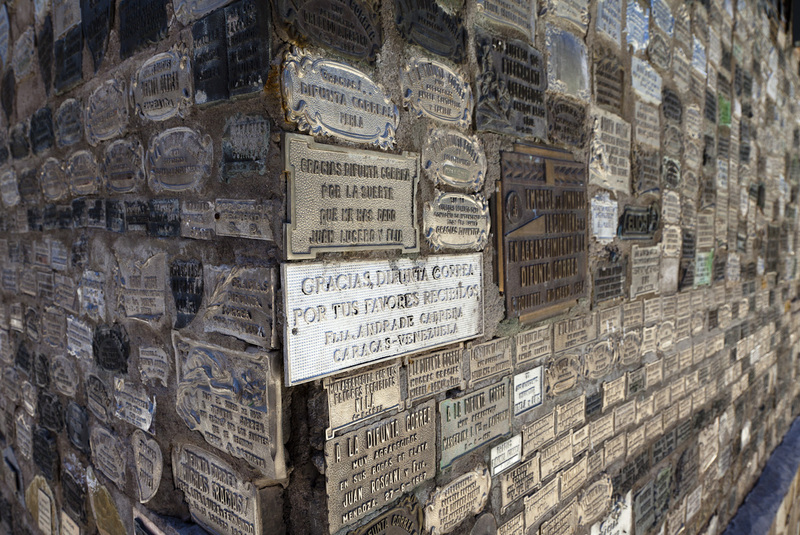 Plaques of gratitude are embedded into the concrete plaster of each building. The Virgen de Guadalupe, who is considered saint by the Catholic church and resides there, is a frequent participant in religious processions….. 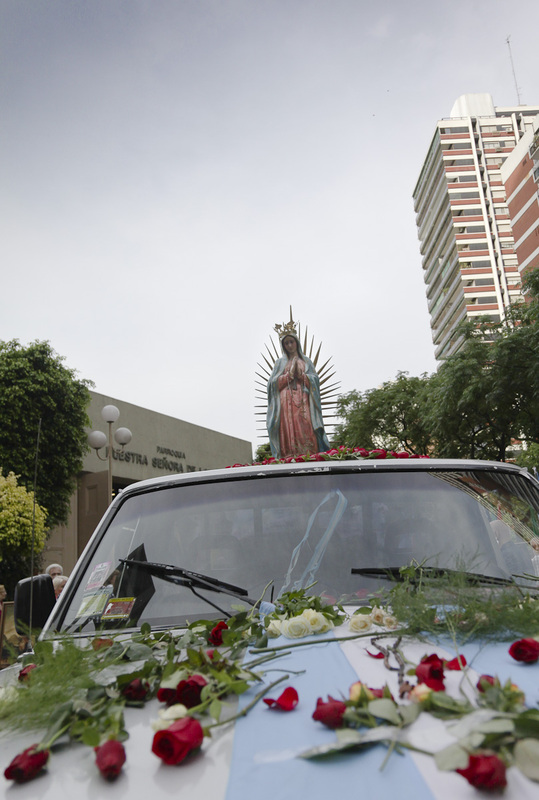 Unlike the Virgen de Guadalupe, La Difunta Correa, is a folk saint whose manner of death captured the imagination and hopeful desires of the Argentine public who make regular family pilgrimages to honor her. The tombs are an image and are filled with images. 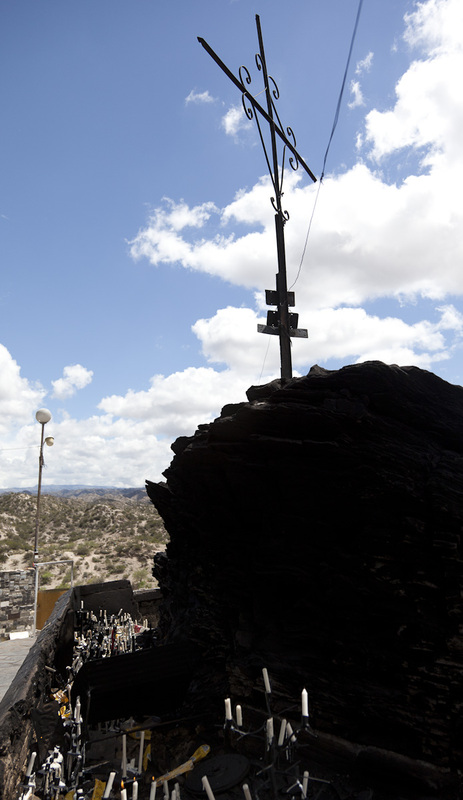 The icons that surround the site of the body’s burial represent the miraculous power that has been attributed to that individual. 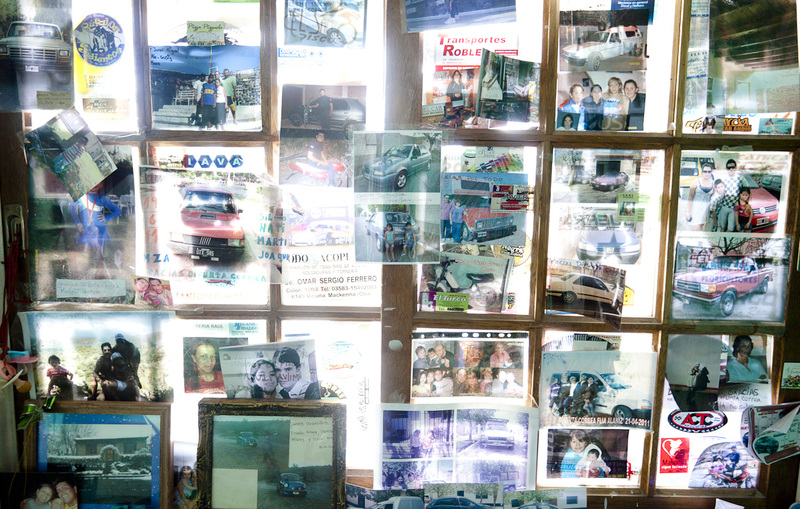 The photographs plastered over every available space…and several layers deep, represent the hopes of followers. But I think many people visit to witness the obsessions of others. Robben, A. (2004). State Terror in the Netherworld: Disappearance and Reburial in Argentina. In A. Robben (Ed. 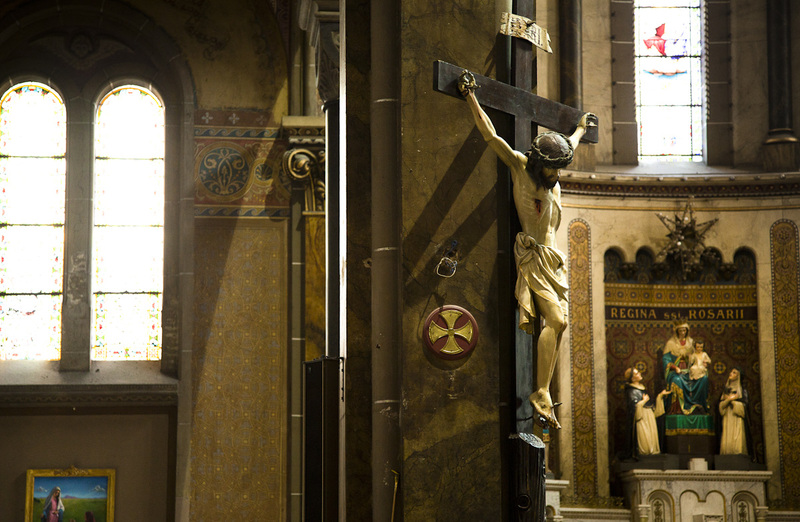 ), Death, Mourning, and Reburial: a cross-cultural reader. Cornwall: Blackwell Publishing. This entry was posted in Digital Photography, Fine Art Photography, Photography, Uncategorized and tagged Argentina, death, Difunta Correa, digital photography, Douglas Barkey, fine art photography, photography, politics, power, ritual. Bookmark the permalink. Gracias hermano, El Señor de la Peña da muchos recuerdos de los viajes a Aimogasta. You would be surprised to see how cleaned up it is now and turned into a tourist stop. 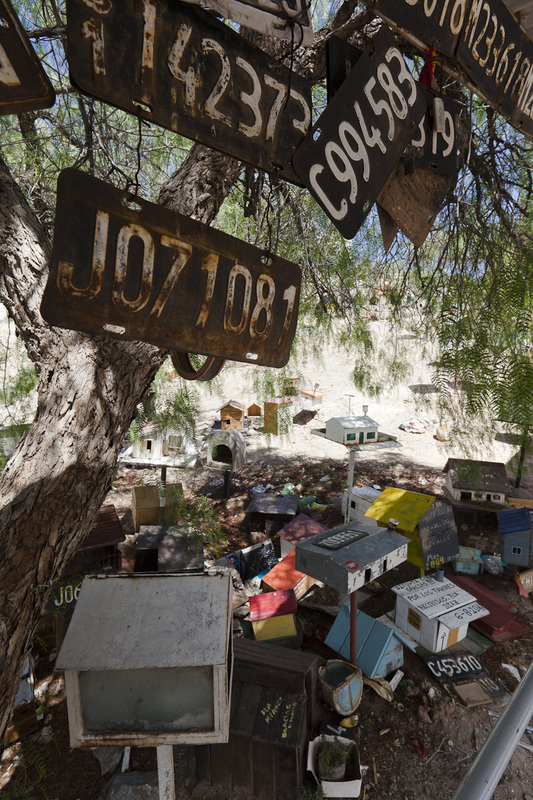 What a fantastic photo essay–it makes one want to see more pictures and go there. The beautiful picture of La Iglesia del Espiritu Santo is something, together with the procession, that I find quite unusual as I remember Palermo, living right across the parque, y nunca haber asociado cierto entusiasmo religioso con este barrio–si no con ciertos barrios como La Boca, y por supuesto ciertas provincias. 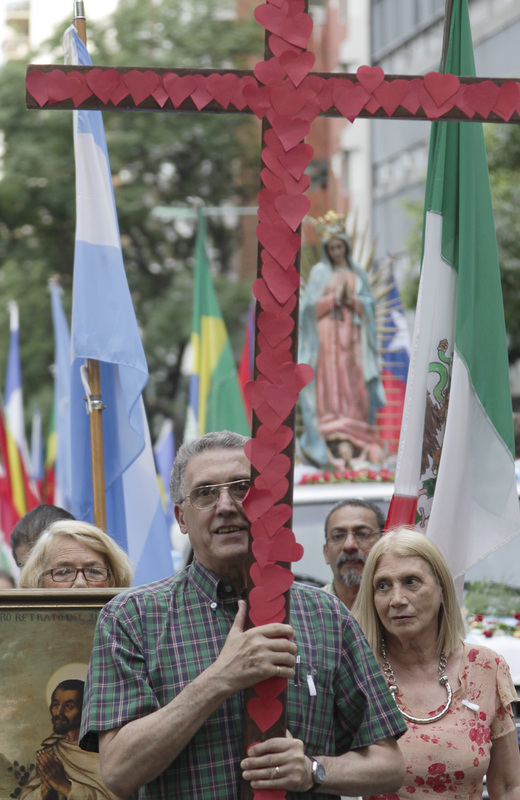 I am not sure how often the processions occurred, Gabi, because the nativity season probably increases the number of public demonstrations of faith like this. It was an diverse mix of age and gender, but not class. Thanks, Billy! Please feel encouraged to add in your point of view. Sup. Actually would like to place a swift commentary and inquire where you grabbed your particular web publication model I am starting own web page and absolutely like your specific theme. My Theme is called Twenty Ten and it is a free theme that WordPress offers. Cheers! Thank you, please feel encouraged to post your point of view on topics. I was looking exaxtly for this. Thank you for your effort. I hope you will write more such interesting posts. Very intreresting blog. It was relavant. Thanks, I am glad that you found this useful and thought provoking. Please feel encouraged to contribute your thoughts also. Very intreresting post. It was very relavant. I was looking exaxtly for this. Thank you for your effort. I hope you will write more such useful posts. Hey Doug, This was a very interesting insight into Argentine culture. Although I was aware of the Ancestral worship of the Far Eastern cultures I was ignorant of this practice in Argentina; thanks for your Photo Essay. I found your sequencing interesting, moving from the religious setting to the secular, and later weaving the religious back in by referencing both the secular and religious saints. I got more than just the sequencing, but I am afraid that I may be running out of space so thanks for a very interesting essay. 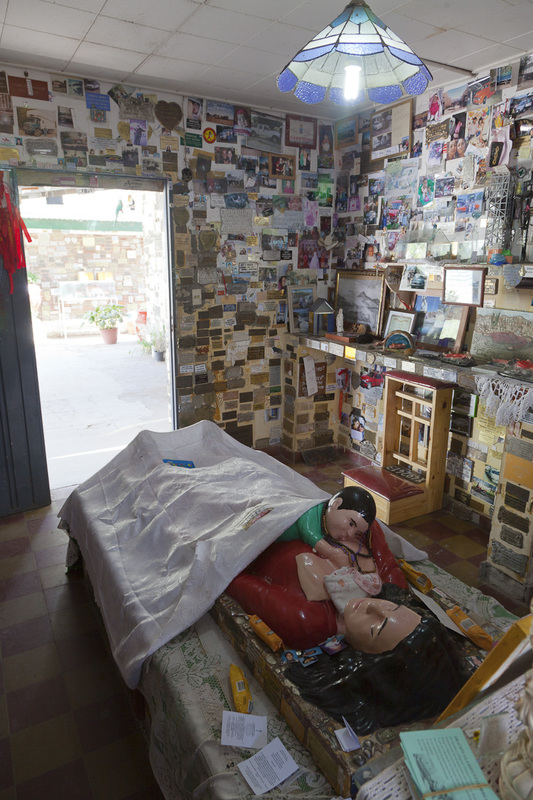 Argentine mass culture has a deeply embedded current of folk saints and legends that is quite fascinating. Thanks for your comment!